Registration is now OPEN - Get your Tickets or Table Today! Thank You For Making Our Golf Event A Huge Success! 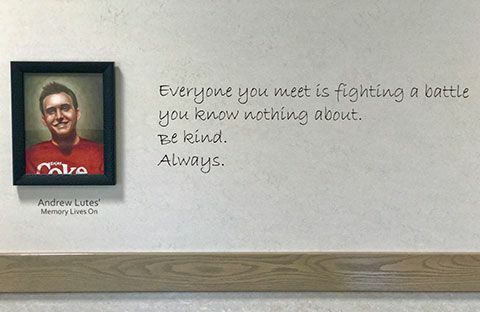 The endowment was established in memory of Andrew Lutes who died of suicide in January of 2014. The endowment is managed by the Community Foundation of Tampa Bay and benefits all critical services and programs for children at Gracepoint. 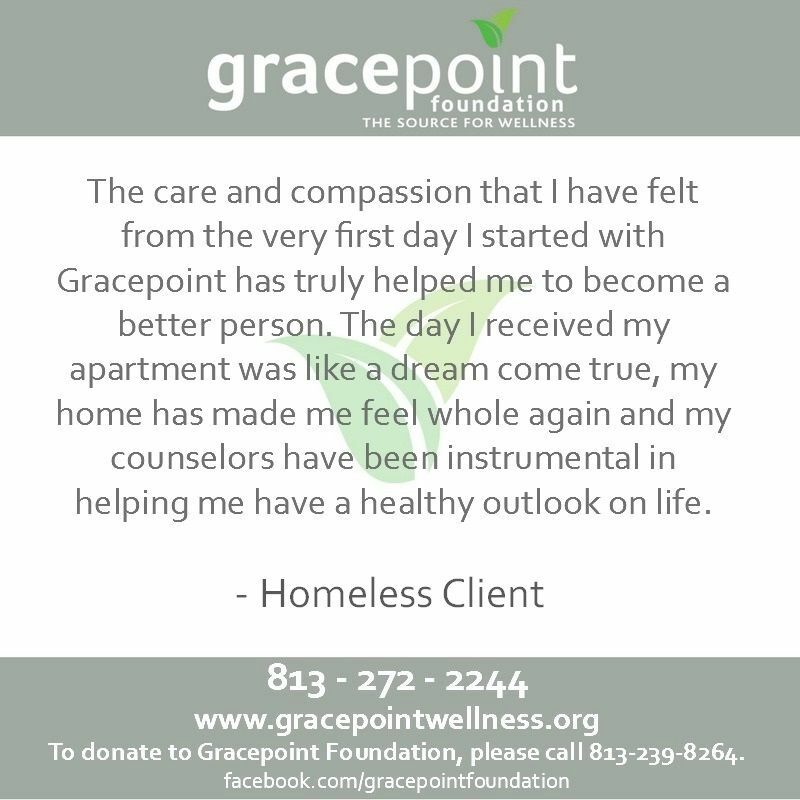 Because of YOU, Gracepoint is able to positively impact the lives of more than 22,000 people each year seeking mental health and addiction services. As a Foundation supporter, you are updated quarterly on news features, successes, and how your investment is making a difference. THANK YOU for considering making a gift to support our efforts to provide behavioral health services for those in need. Each day the lives of children and adults are changed because they were able to have access to critical services. Your support makes that happen! With more than 30 programs Gracepoint has a number of ways YOU can get involved. Support can come by making a financial contribution, serving as a committee or Board member, sponsoring an event, or in the form of in-kind donations or services. 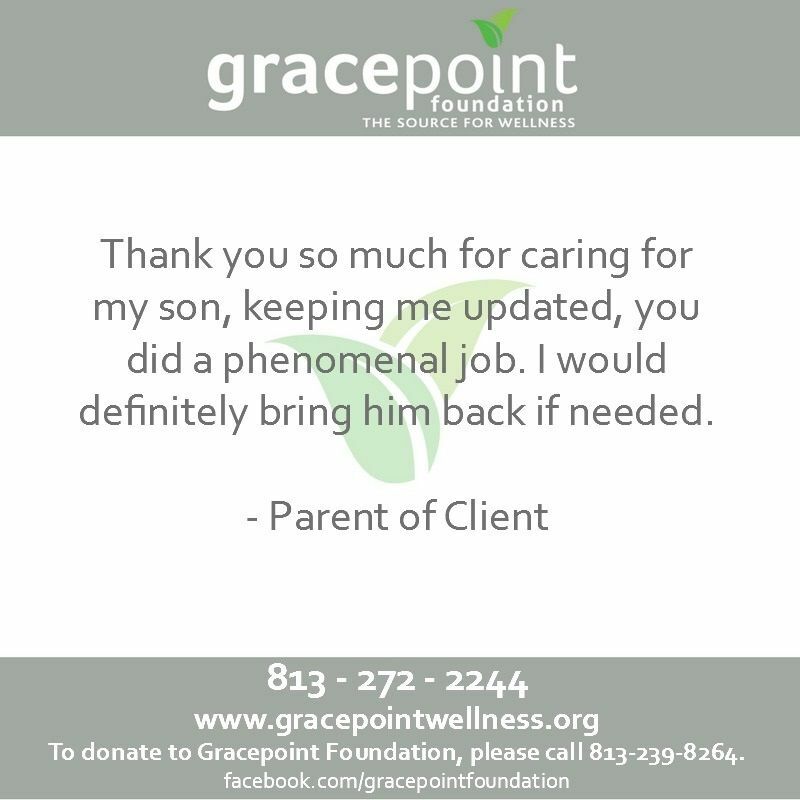 Since 1949, Gracepoint Inc. has worked to become Tampa Bay’s leading provider of behavioral health solutions. 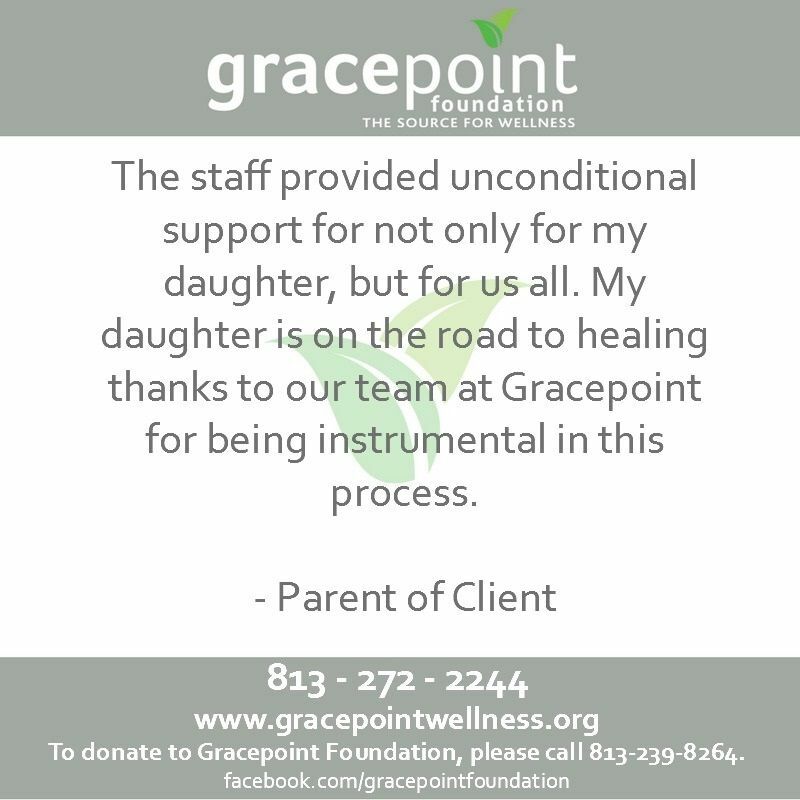 Gracepoint is a full-continuum behavioral health provider of mental health and substance abuse services. 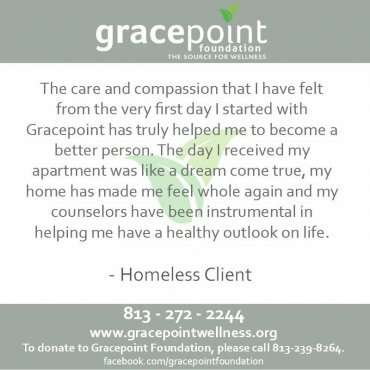 Gracepoint’s mission, is to immediately respond to all people to improve their lives by delivering integrated mental health, substance abuse and medical care to promote health and wellness. The mission of the Gracepoint Foundation is to raise awareness, financial support, and promote the programs and services of Gracepoint Inc. with individuals, corporations, and community partners. 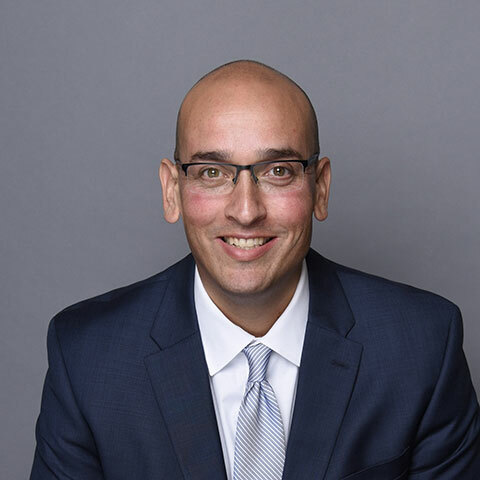 The Foundation board and staff are committed to supporting a strong mental health care system in our community through education, awareness, and by assisting those who want to get involved. 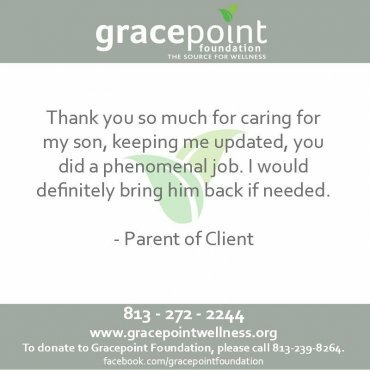 Gracepoint impacts the lives of more than 22,000 individuals (children and adults) in our community each year, seeking mental health and addiction services. Gracepoint is the leading behavioral health service provider in the Tampa Bay area and serves as the behavioral health emergency room for Hillsborough County. 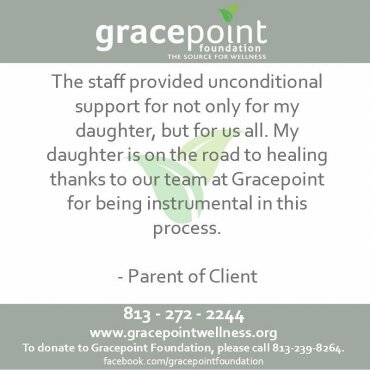 Gracepoint provides both inpatient and outpatient behavioral health care for children and adults. We serve our community through a wide range of programs and services that include: behavioral health treatment, substance abuse treatment, supportive and affordable housing, homeless services, family support services and case management. Research tells us that 1 in 4 people will suffer some form of mental illness in their lifetime – Gracepoint serves to meet this need in our community. We strive to provide individuals and families with the highest level of professional care that is delivered with dignity and respect. Through sponsorship, in-kind donations, or investing in our programs – YOU make a difference! This event is held at Avila Golf & Country Club in late February each year and includes a Champions dinner and ceremony the night prior to the tournament. This is a unique 2-person team, best ball, competitive golf tournament - with prize money, vacation destinations, and a trip to the Masters Golf Tournament all on the line for players to win! This is an evening event held immediately following Mental Health Awareness Month in early June. The theme of STS changes every year and is not announced until prior to the event. 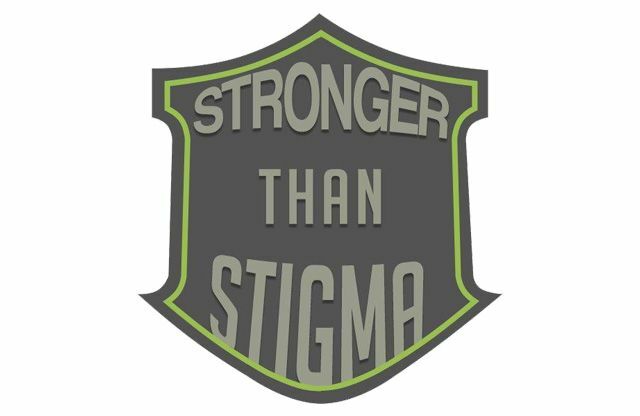 STS is a recognition and celebration event for professionals, care givers, stigma fighters, supporters and community partners in the mental health sector. 1 in 4 people will suffer some form of mental illness in their lifetime, Gracepoint exists to meet this need in our community. THANK YOU for considering making a gift to support our efforts to provide critical behavioral health services in our community.